Of all the ways Windows 10 has found to annoy us we must admit that it manages to do some things right. 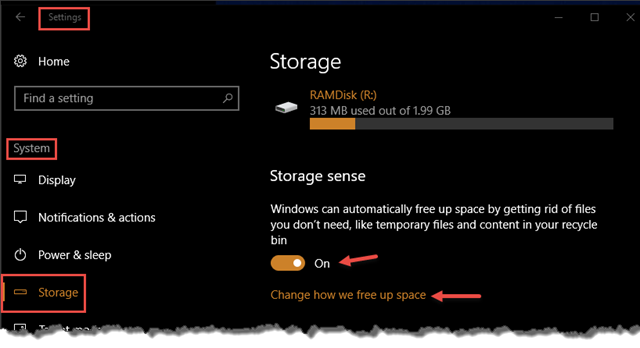 One of these might be overlooked if you are not aware of it, and that would be a feature called Storage Sense. In the old days, if you wanted to free up disk space or defragment your hard drive, then it was a manual task which you had to remember to do on a regular basis. Not so with Storage Sense. Windows 10 will now help to keep your hard drives running smoothly and, by extension, your computer system. If you would like to learn how to enable Storage Sense on your system, then this week’s Quick Tips article is for you. Note: You may have to scroll down past the list of drives on your screen in order to see the Storage sense heading shown in the above image. To see a couple more settings, click the link labeled Change how we free up space. Toggle the above settings to On or Off as you see fit. 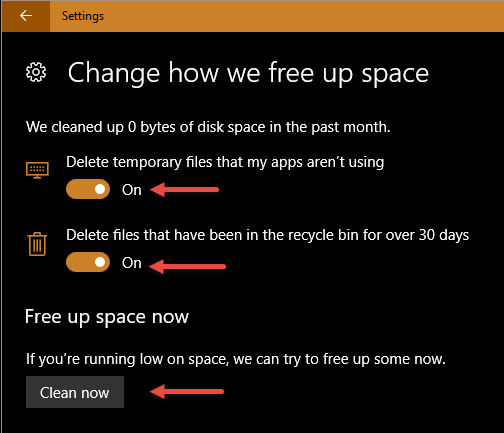 You can also click the Clean now button to perform the cleanup immediately if you want. That’s it! 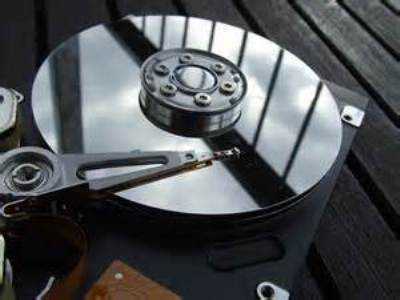 Windows should now help to keep your drive space reasonably managed from now on with no intervention from you. As usual these options do not exist on my PC. What version of Windows are you currently running? Home or Pro? What version and build number? On my PC it is W10 version 1703 OS Build 15063.540. KB4034674 will install this version. What’s the jist about defrag and the SSD ? Should they be defragged..(if that’s a word ?). Absolutely do NOT defragment an SSD! Not only is it a total waste of time, it can actually shorten its life span. If you choose to Optimize an SSD using Windows, then Windows is smart enough to send a TRIM command to the drive which is the correct approach.